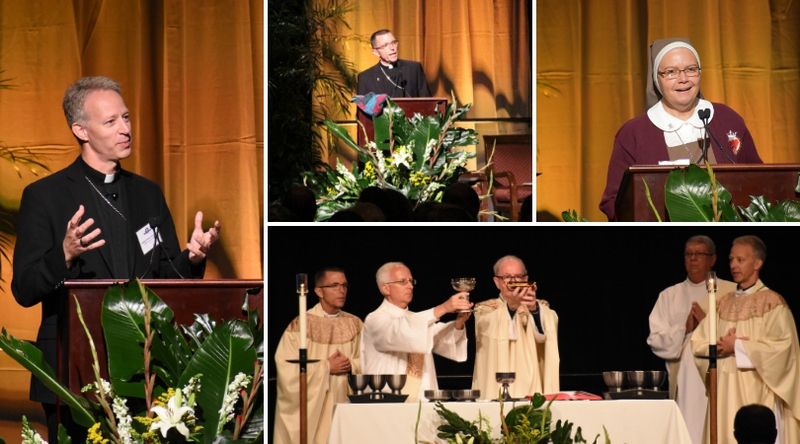 More than 1,000 faithful gathered to listen to three very different speakers share insights regarding the Eucharist at the Rosen Shingle Creek Resort in Orlando, Sept. 8, 2018. As part of the Diocese of Orlando 50th anniversary jubilee, honoring the Year of the Eucharist, The Gift of Sacred Mystery delved into the Eucharist as gift, as sacred and as mysterious encounter. Read more here. These videos are copyrighted material owned by the Diocese of Orlando and may not be copied, reproduced or altered in any way. Bishop William Wack, CSC, from the Diocese of Pensacola-Tallahassee talks about the gift and the Real Presence of Christ in the Eucharist. Sister Maria Acosta, SCTJM, Pastoral Assistant at Annunciation Catholic Church in Altamonte Springs, talks about our participation in the Eucharist and self-offering. “Gaze Upon My Heart” performed by Servants of the Pierced Hearts of Jesus and Mary from Annunciation Catholic Church and Bishop Moore Catholic High School. Bishop Robert Reed, Auxiliary Bishop of Boston and President/CEO of iCatholic Media, Inc., talks about our encounter with the mystery of faith and Christ’s sacrifice in the Eucharist. Bishop John Noonan reflects the power of prayer in our daily living during his homily.